Atlanta, GA, September 24, 2018 - Anyone in the industrial, transit and protective packaging sector knows there has been a significant need for a dedicated industry event. The success at INDUSTRIAL PACK 2018 was proof that we were providing an important new platform to this often overlooked piece of the global supply chain. INDUSTRIAL PACK 2019 will bring together over 1500 of the top multi-sector buyers and specifiers from the most innovative global corporations. They represent some of the largest organizations from agriculture, horticulture, chemical, pharmaceutical, cosmetics, automotive, food & beverage, plastics, building & construction, oil & lubricants, and personal care. 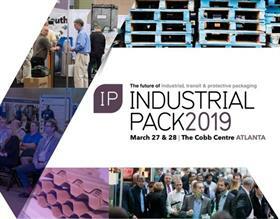 Over 100 of the top industrial packaging suppliers will exhibit, where they will share their innovative packaging solutions and engage with visitors who are looking to solve their biggest packaging challenges. INDUSTRIAL PACK 2019 will provide conference sessions covering the most talked about topics, lead by top experts. Visitors will take part in unique networking opportunities, interactive features, and Pack Testing LIVE. The highlight for everyone attending will be the second annual INDUSTRIAL PACK AWARDS, where we will honor North America's most innovative packaging businesses. A panel of expert, high-profile judges will choose the 2019 winners.